If you are anything like me, you have big plans for dinner at the beginning of the week, but as the week goes on and things get busy, I am searching for the easiest thing to make. Enter Classico. I received the Classico Organic Tomato Basil sauce to try and review. I usually purchase Classico marinara from Costco, because it is our favorite jarred sauce that we have tried over pasta. It was a use up what is in the fridge kind of dinner. I had been working all day and Dex wasn’t feeling like himself, and Gus unplugged his G-tube in the middle of me trying to cook. Anyway- I thought I would share a quick and easy recipe that used what was in my fridge as well as the yummy jar of Classico sauce. 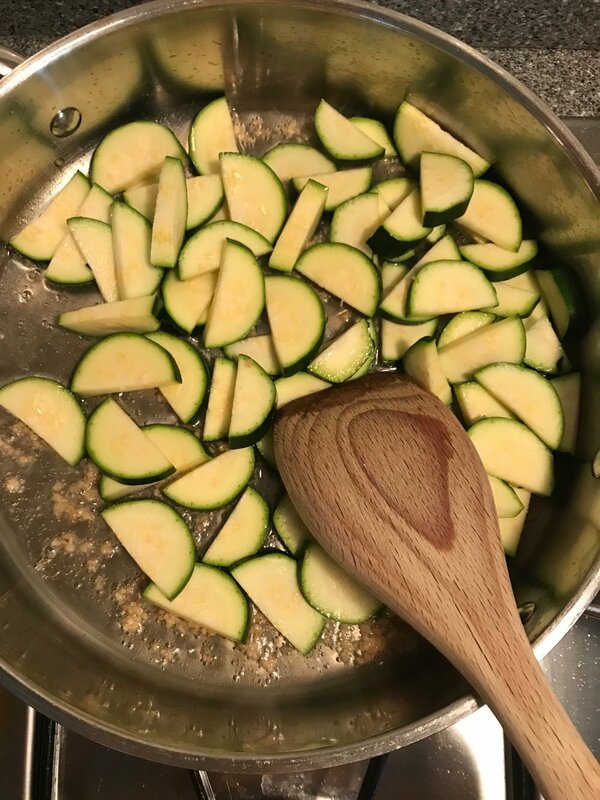 Then, i added two zucchini that I halved and sliced thinly, salt and pepper. Once those were almost done, I added sliced white mushrooms and more salt and pepper. While I was waiting for the mushrooms to cook down, I boiled the water for our favorite Banza pasta . It is made from chickpeas, and is by far my favorite pasta of any kind! I threw it in once the water was boiling, and let it cook while I finished the sauce. Once the mushrooms and zucchini were completely done, I poured in the jar of sauce and let it combine with the veggies and simmer until the pasta was done. I drained the pasta, and put it in the sauce. Stirred it up and dinner was ready! I will definitely be making this again! It is Noel family approved. I would love to hear your favorite, easy meals! I am always looking for new ones!